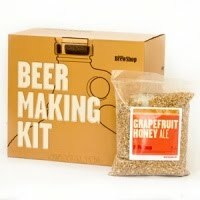 Via The Kitchn: Brooklyn Brew Shop has a one-gallon, $40 all-grain brewing kit that looks like a great option if you are one of the dozens of people who has told me you'd like to start brewing but that it seems intimidating. It's a super small batch of beer (two six packs), but it'll give you a sense of what goes into the process, and the various types of beer they have on offer look tasty. I'm a little skeptical of the value of doing only one gallon at a time - this kit is $40, which is the cost of ingredients for a 5-gallon batch - but it's worth it if you don't want to invest the $200+ in the gear (boil pot, carboys, etc) for the larger boil. So do it! And let me know how it goes.